Precious metals futures ended divided Friday with gold and silver lower and platinum and palladium higher. All but palladium advanced on the week. Gold, silver and platinum scored their second straight weekly gains. Gold for April delivery on Friday shed $3.10, or 0.2%, to settle at $1,322.10 an ounce on the Comex division of the New York Mercantile Exchange. Gold futures moved up 1.9% this week after rising last week by 1.2%. On Thursday, they settled at their best price since April 24 and ended January with a 3.4% increase. The yellow metal has advanced in six of the last seven weeks and is 3.2% higher on the year to date. "Sixteen market professionals took part in the Wall Street survey. There were 10 votes, or 63%, calling for higher prices. Two respondents, or 13%, said lower, while four, or 25%, said sideways. Meanwhile, 561 respondents took part in an online Main Street poll. A total of 357 voters, or 64%, called for gold to rise. Another 135, or 24%, predicted gold would fall. The remaining 69 voters, or 12%, see a sideways market." Elsewhere Friday, silver for March delivery lost 14.1 cents, or 0.9%, to close at $15.931 an ounce. Silver futures gained 1.5% this week after rising 2% last week. On Thursday, they marked their best close since July 10. The precious metal is 2.5% higher on the year. April platinum added $2, or 0.2%, to $826.70 an ounce, for a 1% weekly gain. Palladium for March moved up $13.70, or 1.1%, to $1,313.60 an ounce, but lost 0.5% on the week. Both are higher on the year so far with increases of 3.2% for platinum and 9.7% for palladium. Gold declined $4.55, or 0.3%, to $1,318.70 an ounce. Silver fell 6.5 cents, or 0.4%, to $16.01 an ounce. Platinum rose $4, or 0.5%, to $825 an ounce. Palladium declined $12, or 0.9%, to $1,368 an ounce. In LBMA weekly results, gains reached 1.9% for gold, 4.1% for silver, 1.6% for platinum, and 2.8% for palladium. 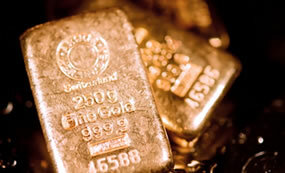 Gold bullion coins rose by 5,000 ounces after rising by 4,000 ounces last week. Splits include 4,000 ounces in American Gold Eagles against 2,500 ounces previously and 1,000 ounces in American Gold Buffalos versus 1,500 ounces previously. American Silver Eagles climbed by 116,500 ounces after advancing by 375,000 ounces last week. American Platinum Eagles rose by 2,000 ounces after being unchanged last week.